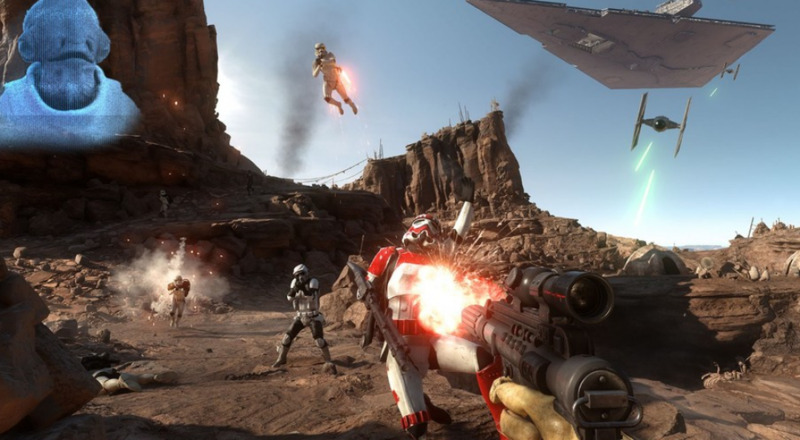 In Battlefront's Survival Missions, you and a pal are stuck in a tough situation. Fifteen waves of Storm Troopers and AT-STs are out to get those two annoying rebels in some of the most familiar Star Wars locales. The trailer only showed two rebels teaming up to blast stormtroopers and waste AT-STs, but let's hope we'll be able to bring a cadre of our best buds to hold out against Battlefront's horde mode. After all, spending a hundred troopers, a bunch of ground vehicles, and a dang star destroyer trying to get two rebels seems like kind an cost/reward nightmare. The trailer also shows two generations of Skywalkers duking it out with lightsabers. Maybe players will be able to hop into the well-worn shoes of one of the galaxy's last remaining Jedi for some saber battling. The finale takes us from the dust-bitten dunes of Tatooine to the lush forests of Endor. Who knows where our rebel protagonists will face off against Perhaps we'll find our heroes battling for survival in the stormy plains of Dantooine, or even some of the yet-unseen locales of the expanded universe.